It appears KFC is jumping on the Game of Thrones bandwagon by giving its ‘Hot & Spicy’ campaign a fiery twist. The fast-food chain launched its ‘Hot & Spicy’ campaign last year, which featured images that swapped flames for the image of hot and spicy batter on its chicken. 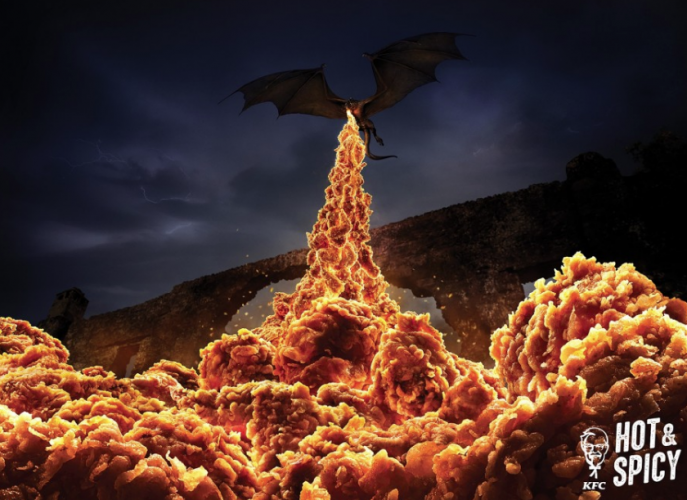 To honour the final season of GoT, which premieres in Australia tonight, KFC has given the hit HBO show’s classic dragon image a makeover, replacing the fire with chicken. The campaign, via Ogilvy, is part of KFC’s strategy to participate in popular culture. Marketing director of KFC Hong Kong Shirley Chau said: “KFC has always been part of the cultural conversation, so the upcoming premiere was the perfect opportunity to remind customers that the best way to enjoy the show is by grabbing a bucket of Hot & Spicy to share. Executive creative director Ogilvy Hong Kong John Koay added: “This new Hot & Spicy campaign is a nod to a show that has become a global phenomenon, just like KFC. The image will be shared online, in print and outdoor.